I really didn’t want the season to end. 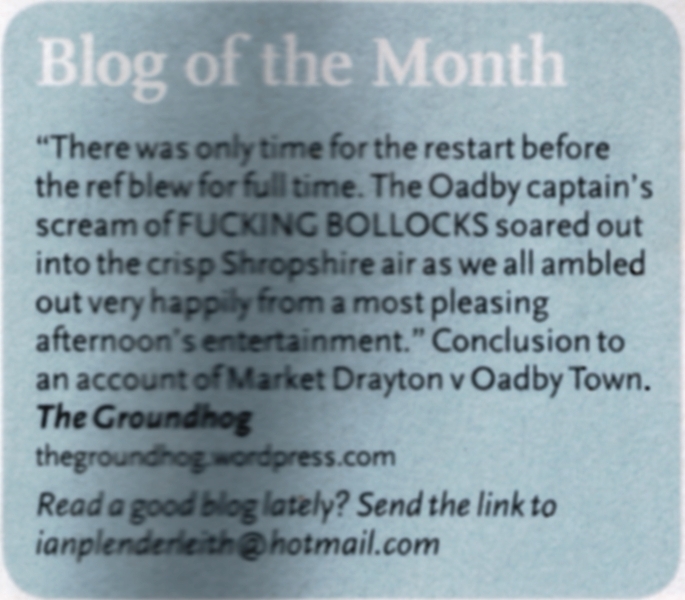 My desperation for just one more game, after much searching, landed upon the very last game of the Hope Valley Amateur League Premier division and a fixture that sounded positively Dickensian. The other eleven clubs in the division had finished their fixtures with Bradwell crowned champions. 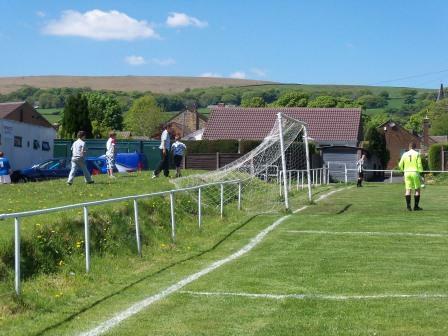 Tintwistle could secure second spot with a win today. Brampton would be finishing eighth, whatever. I had a feeling I might regret this jaunt, before setting off. Close on forty miles for a pitch? Mind you, my last two grounds were similarly standless and non floodlit, but did come with the excuse of being local. This one threatened to be the bottle of cheap spirits for the drinker or the crack pipe for the recreational drug user. Tintwistle lies north of Glossop in the High Peak, at the lower end of Longdendale Valley. It has a population of 1,400. It’s one of those places that like to be able to differentiate strangers readily, hence the unintuitive pronunciation of their town. They say Tinsel; people who come and say Tint-wistle stick out like sore thumbs, and sometimes never leave, especially around pagan festivals. The journey was pleasant, through Leek, Buxton and Chapel-en-le-Frith. With the sun shining I could pretend I was out for a leisure drive to appease my guilt. The ground lies at the bottom end of a small estate , just above the river Etherow. Access is down a dirt track off West Drive; you drive past the club house to a large car park beyond the pitch. It was a hot day, the views were good and the ground wasn’t as bad as I feared. It fit snugly behind the houses of West Drive, a school and the clubhouse, was fully railed and had a grass bank behind the goal as you come in. The goals were rather weird, the net riding high up the grass bank, attached to rusty stanchions with their blistered white paint. This was extreme non league. Come two o’clock, the scheduled kick off time, there was a scare. Brampton had only seven players including the goalkeeper. I spent an anxious 20 minutes waiting for Brampton players to come trickling in – I guess this is a hazard of watching games this far down the pyramid. Luckily a full complement arrived and the game kicked off 20 minutes late, albeit with the Tintwistle manager and one of their subs doing the lines. I’d never seen such bizarre linesmen. The host’s manager was clad in jeans and jumper and smoking fags, giving advice to his team and occasionally swearing at the referee. Having amassed the requisite players, Brampton didn’t just make up the numbers but, surprisingly, dominated their higher positioned hosts. They played better in all areas, creating many chances, racing into a three goal lead. Their fourth was the best goal I’d seen all season. Slick approach play saw the ball played to the winger who cut inside, whacking the ball over to the other side of the pitch where their number seven met with it perfectly to hammer it in to the top corner. It was a world class goal scored by a team who finished 8/13 in a division that doesn’t even seem to appear in the pyramid. It’s humbling to think that such quality is still ripe a million miles away from the Premier League. It was 4-0 at half time; with Brampton having missed two sitters. 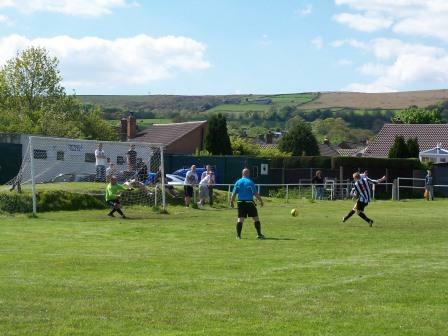 Tintwistle had barely bothered the brampton goalkeeper. The runners up spot was looking unlikely to say the least. They brought on the linesman at half time, which left no linesman on one side. The guys who were subbed refused to run the line, so it was left to a 15 year old lad, who was happily watching the game up to that point. The Tintwistle manager resumed his earlier linesmanship on the other side, which included some expletives at the referee, after the 15 yo’s controversial offside flag at what would have been 2-5. 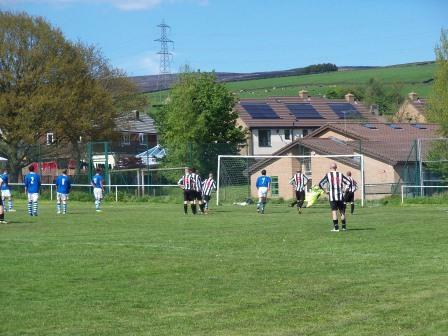 Tintwistle did improve but still struggled to creat clear cut chances. Their only goal was a badly hit penalty after going 5-0 down. The game finished 1-6 which included a saved Brampton penalty. A strange game considering their respective positions beforehand, but nevertheless a good game of football to watch at an interesting venue. I actually felt justified in going afterwards, something I thought was unlikely on my way there. A good full stop to the season. 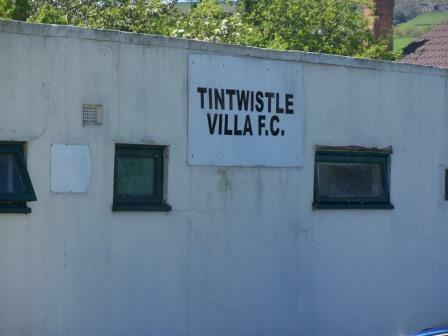 Who the **** are Tintwistle Athletic? This entry was posted in Travelog and tagged brampton fc, hope valley league, tintwistle, tintwistle villa, west drive. Bookmark the permalink. 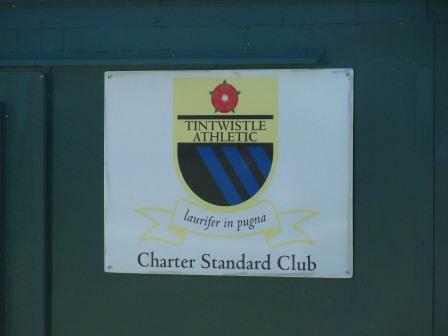 Tintwistle Athletic are a charter standard club currently with 9 teams from U7;s through to open age, The open age have 2 teams in the Lancashire & Cheshire League and play at the 3G pitch at Glossopdale, The juniors play at West Drive playing fields.